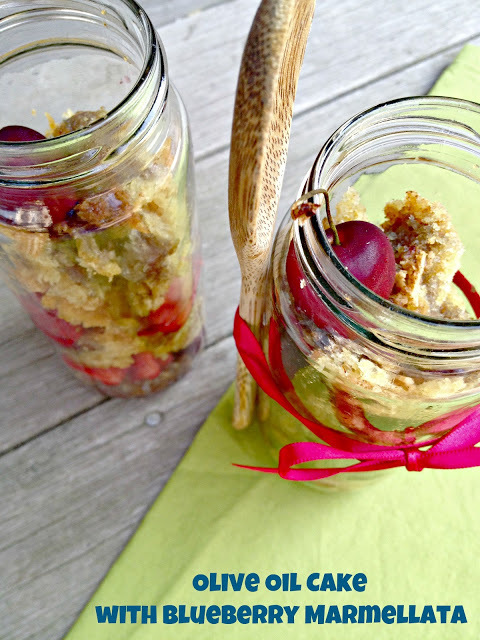 Classic olive oil cake parfaits are delicious, easy to make desserts. Moist olive oil cake is layered with blueberry marmellata and fresh cherries. It’s a taste of summer in a jar! Disclosure: This is a sponsored post for Bertolli® Olive Oil for the Where Flavor Comes From Summer promotion. I was provided a pair of grilling tongs and brush,and olive oil along with monetary compensation for this post. All opinions are 100% my own. All this week, Virtual Potluck is partnering with Bertolli Olive Oil to help promote their Where Flavor Comes From Summer Grilling campaign. Find the complete list of participating bloggers here. Bloggers were given exclusive grilling recipes, and a recipe for classic olive oil cake from Top Chef’s Fabio Viviani. We were also given information to share about the Let’s Cook Summer Sweepstakes. The Let’s Cook Summer Sweepstakes, launched on June 15th. It’s a Facebook-based sweepstakes celebrating the tastes of summer, and it offers prizes to help at-home cooks discover where flavor comes from. The Grand Prize is a trip for four to Los Angeles for a one-on-one cooking lesson with Chef Fabio Viviani, or $5,000 for a kitchen makeover. Other prizes include Bertolli Olive Oils and Bialetti cookware. The Let’s Cook Summer Sweepstake is hosted on Facebook. Where Flavor Comes From is a brand new site dedicated to summer grilling. You can download the free Let’s Cook! app, available for iPad, iPhone and iPod touch, with more than five hours of exclusive step-by-step cooking videos from Chef Fabio Viviani. I added fresh cherries and strawberries to the marmellata, as well as 1/4 cup pomegranate grenadine for extra soaking liquid. After the cake cooled, I crumbled it into pieces and layered the berries and cake in a glass jar. Now here’s the dessert recipe, for classic olive oil cake parfaits. Enjoy! Preheat oven to 350°. Add eggs and 1-1/4 cups sugar in medium bowl and beat with electric mixer on medium-high speed until eggs are white and fluffy, approx. 5 minutes. Slowly stir in milk. Slowly add flour. Add in baking soda and baking powder and mix just until blended. Add 1 cup Bertolli Extra Light Tasting Olive Oil and beat just until blended. Let mixture rest 5 minutes. Coat 13- by 9-inch baking pan with Bertolli Extra Light Tasting Olive Oil. Meanwhile, for blueberry marmellata, heat remaining ¾ cup sugar in large skillet or saucepan until it begins to brown and is caramelized; about 2 minutes. Add lemon juice and ¼ cup Bertolli Extra Virgin Olive Oil. Pour blueberries into caramelized sugar and stir in lemon peel. Cook over medium heat, stirring occasionally, approx. 5 minutes or until blueberries start to burst. Remove from heat. Bake cake in center of oven 25 to 30 minutes or until toothpick inserted in center comes out clean. Cool 10 minutes. Serve a slice of cake and top with blueberry sauce. 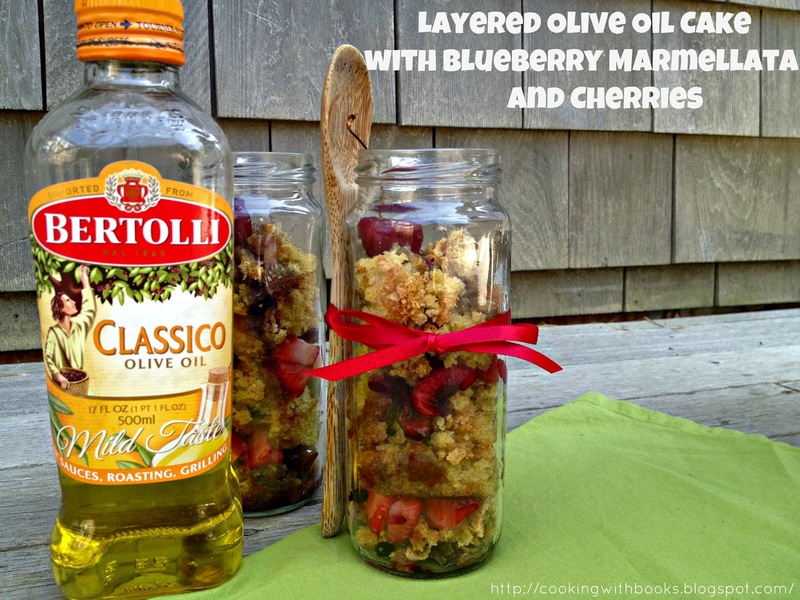 Drizzle with Bertolli Extra Virgin Olive Oil. I added fresh cherries and strawberries to the marmellata, as well as ¼ cup pomegranate grenadine for extra soaking liquid. After the cake cooled, I crumbled it into pieces and layered the berries and cake in a glass jar. I just want to eat a big jar of that…do you deliver? Blueberries and lemon go so well together, don’t they? I bet they make a lovely sauce with the carmelized sugar. this is so creative and fun! love it! I love the idea of cake in a jar-so fun! I still haven’t experimented with making n olive oil cake, but yve inspired my to try making a gluten-free version. Yummy! That looks delightful!! LOVE olive oil cake. oh…. looks like i now have a way to take cake to work and it’s olive oil…..that’s healthy right. Looks awesome Nelly. Love that you served it in jars. Great job! I’m so glad you featured this recipe…it’s so perfect for fresh berry season. My father used to make the best Sicilian marmellata with blood oranges and/or lemons. The blueberry version looks delicious…many thanks! Love your twist on this! This looks very interesting, I would never have thought to do something like this…guess that’s why I’m posting on your blog and not mine! I love fresh blueberries. I have some plants in my garden but they haven’t given me too many this year. Good lookin’ stuff. Love the idea about packing in jars for a picnic!